This little 5 x 7 inch abstract landscape oil painting is one I posted a while ago right after I painted it. It was fun to paint. I loved the abstraction of the rain and the brilliance of the tulips which originally inspired its creation. This painting has SOLD. Today is the celebration of my 275th posting! In honor of the occasion, I am sharing this 5 x 7 inch oil painting that I have been attached to since last summer. I painted it after visiting a nature park near my home and have kept it on my shelf since. 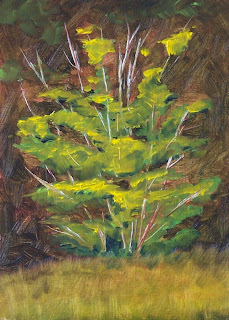 The little tree that inspired the painting was so proud and colorful amongst the larger trees that I couldn't help but admire its strength and beauty. Since my shelves are beginning to overflow with paintings, it is time for me to let go of this little guy. I am listing him in my Etsy shop this week. You can purchase him for $35.00 plus $6.50 shipping to US addresses by clicking here. This little 5 x 7 inch oil painting is one I painted and posted in December when the weather was cold and dreary. 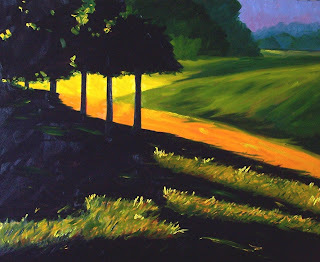 Painting images of spring and warm weather always cheers me up during the dark days of winter. I have enjoyed the painting for several months, but must now say good-bye and have listed it in my Etsy shop this week. 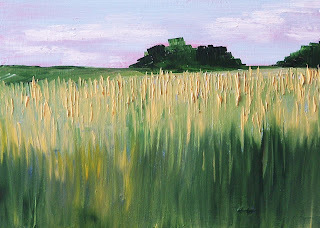 I especially like the heavy impasto (thick paint) that provides a texture similar to the wheat it represents. 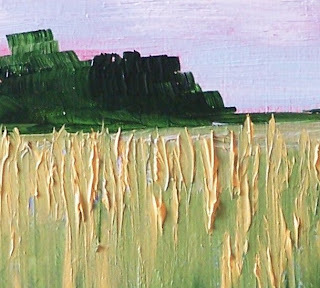 Here is a closeup of the impasto. This painting may be finished. I have been tweaking around with it for about two weeks. 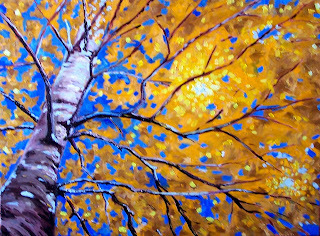 Inspiration came for this painting from looking up into the limbs of a birch tree on a gorgeous sunny day last fall. I loved the way the sunlight glittered through the golden leaves. The painting is 18 x 24 inches on stretched canvas. Along the coast of Gray's Harbor in Washington State are numerous beaches with rocky shores and grassy landscapes. This paintings is inspired by one of those beaches. Warm weather and sunshine brings out the visitors who engage in all kinds of wonderful outdoor activities. An autumn hike is what I had in mind when I created this 8 x 10 inch oil painting. Crisp air and an early morning fog helped me to recall hiking with my parents near Alder Lake in Washington State. The sun was out again today and although it looked like a summer day, it was cold. 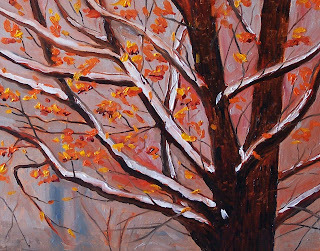 In my desire for the warmth of summer, I created this 8 x 10 inch oil painting of a maple tree in summer. I'm looking forward to summer foliage, long days, and warm evenings. Today was a beautiful, sunny day; the first one in a long time. The air was crisp and people were out enjoying the break from the winter rains. 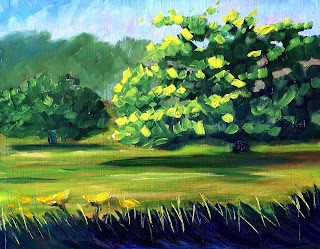 This painting was created at the Dog Park at Fort Steilacoom Park. Dogs of every size and shape scampered about as I worked, but none of them would hold still long enough for a portrait. It was a challenge to paint in the bright light of a sunny afternoon. I had difficulty determining color and had to depend on value--the dark and light of things--a great learning experience. 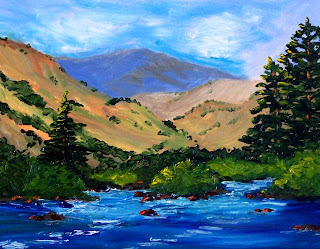 The painting was completed in oils on a 6 x 8 inch canvas panel. Painting larger works is something I enjoy doing when I can find the time and space to do so. 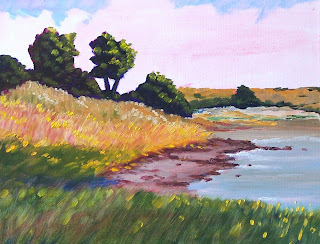 This painting was an enlarged version of one I completed earlier in a 5 x 7 inch format. I was especially attracted to the contast between the dark shadows of evening and the brilliant sunlight that slid across the grass. This version is 24 x 30 inches. The Yakima River in Washington State is known for fishing and rafting. It isn't the big whitewater draw of other rivers, but a great site for a beginners who want to "float the Yak." The gentle nature of the river and the warm summer sunshine are a big draw, especially to college students wanting a break from the daily grind. It winds past the towns of Cle Elum, Ellensburg, and Yakima as it traverses the landscape. The Yakima inspired this 8 x 10 inch oil painting. Spring is around the corner. 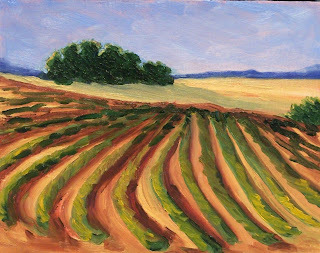 Farmers will be preparing their fields soon for planting of the first crop. 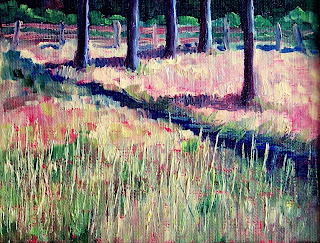 This 8 x 10 inch oil painting was inspired by memories of the season's first growth in an Eastern Washington field. I'm anxious for the spring season to approach. One of my favorite subjects is Mount Rainier in Washington State. I especially love the colors of the mountain as the light shifts across the rocks and snow at sunrise. The Nisqually Glacier that rests on its flanks was especially inspiring as I painted. 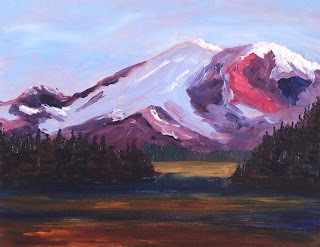 This 8 x 10 version of the dormant volcano was created with oil paints on a gessoed hardboard. 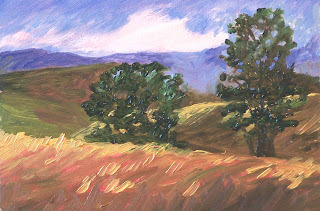 Fresh air and a country breeze inspired this little hillside tree painting. I'm longing for days when I can stand outside and breath in fresh air without standing in under a downpour of rain. Spring is around the corner. 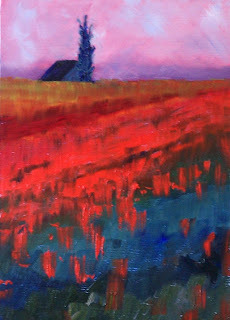 This painting is 5 x 7 inches on 1/4 inch gessoed hardboard. Last week snow arrived in the Pacific Northwest--heavy amounts of snow. Snoqualmie Pass was closed for almost a week due to avalanches. Commerce between the east and the west stopped completely. Luckily for those of us who live in the lowlands, it settled gently and disappeared again before the day was over. This 8 x 10 oil painting was inspired by the recent snow. 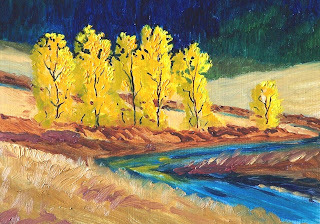 Very intentional brush strokes helped me keep the yellow paint of the trees clean and fresh on this Prussian Blue background. Prussian Blue and its modern counterpart, Thalo Blue, are a very intense blue-green color that can easily pollute every color encountered. 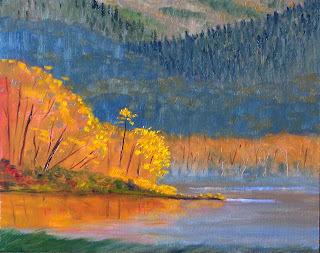 It is so easy to turn yellow trees to green when working with these intense blues. Thus, I am happy that pollution didn't occur on this little 5 x 7 inch oil painting on gessoed hardboard. This painting has SOLD.